In 1962, Sunny Fields was purchased by Elmer and Jane Horman. The property includes 40 acres, 30 of which were in grain, with 10 acres that remain a beautiful forest of primarily beech, maple, and oak. It was retired from farming, and the Horman family began tree planting, including a modest orchard of “antique” fruit varieties. Their son, Bill, began a collection of woody ornamental plants from around the world as well. Bill spent 30 years (1964-1996) as an employee of the City of Detroit Recreation Department, Forestry & Landscape Division, Floriculture Unit. He worked to grow, maintain, and display tropical foliage and flowering plant material from the greenhouses on Belle Isle in Detroit, Michigan. He became the city’s senior horticulturist, and in 1987 he became a co-founder of the Belle Isle Botanical Society, for which he still volunteers. 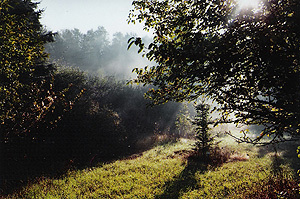 By 1995, the Sunny Fields property was purchased by Bill, who always hoped and strived to make the property a unique botanical park. Under his care, Sunny Fields has become a premier botanical park, where visitors can enjoy its stunning collections and glimpse occasional wildlife while wandering through peaceful, quiet trails. Now, it is dedicated to the memory of his parents and second-grade teacher and life-long friend Nelle Henry. Sunny Fields is a not-for-profit corporation; a 501 (C) 3 organization. As a public charity, all contributions are tax-deductible.